Introduction: Couple of years ago we visited “The Tomb of the Unknown Soldier” at the Arlington National Cemetery in Washington D.C. I’m sure you’ve seen pictures of it or probably been there with your family. It is considered to be hallowed ground because interred below are soldiers from the various wars that were never identified. On the Western Panel of the tomb are the words, “Here Rests in Honored Glory An American Soldier Known But to God.” The Honor Guard keeps watch over the Tomb 24/7 even through bad weather. The soldiers who “walk the mat” are held to the highest standard of behavior. If they do anything that is considered disrespectful to the Tomb, their badge can be taken away if they’re no longer serving at the Tomb. Thousands upon thousands of people come each year to watch the changing of the guards. But if they get loud or sit during the ceremony, the guard will immediately step off the met and call them out – “It is requested that all visitors maintain an atmosphere of silence and respect at all times.” Why such respect? The Tomb is a reminder of the price that was paid for our freedom. It is a time for self-reflection to see if we are living up to the sacrifice that was made for us. We need a similar understanding and self-reflection when we come to the Communion. Our message is called “HEART SEARCH.” It’ll make more sense as we go further. Context: Usually we tack on the Communion at the end of every Easter service. We fail to understand the true meaning and serious consequence of sin in our lives towards each other. The true understanding of the death, burial, and resurrection of Christ changes the way we treat people. Question: How are you treating each other in your life? Do you see others through the lens of the cross? When did you last search your heart? Are you saved? 1 Corinthians 11:18 For first of all, when you come together as a church, I hear that there are divisions among you, and in part I believe it. Background: When we went through our series on love from I Corinthians 13, we learned how Corinth was a Roman colony and it’s population was made up of former slaves, army veterans, business people, and laborers. Yes, there were people there who were original Greeks but most were Roman citizens. We have documentary and archaeological evidence that the Corinthians of the time were known for their pride, arrogance, and self-importance. Unfortunately, this attitude was also creeping into the church. Now they were treating each other with condescension and selfishness. They were divided into groups of haves and have-nots and spirituals and super-spirituals. They were even mistreating each other during the Communion service. Paul wrote the letter to rebuke, to correct them, to instruct, and to bring them to a proper understanding of how believers in Christ should treat each other. Application: Is there a difference between how you lived before Christ and how you live now in Christ? Has there been a change in attitude and behavior in you treated others before you got saved and how you treat people now? 20 Therefore when you come together in one place, it is not to eat the Lord’s Supper. 21 For in eating, each one takes his own supper ahead of others; and one is hungry and another is drunk. 22 What! Do you not have houses to eat and drink in? Or do you despise the church of God and shame those who have nothing? What shall I say to you? Shall I praise you in this? I do not praise you. Background: The early church used to have a love feast (fellowship dinner) every week along with the Lord’s Supper. They used to have a “better room” known as the triclinium (lit. three couches), which was a formal dining room in Roman buildings. Some of the Christians would get there early to beat the rush and get the better seat in the dining room while the latecomers had to crowd into the Atrium. “…and one is hungry and another is drunk.” While people were in the Atrium waiting to get in, many of them were taking their time eating and drinking and actually getting drunk! In essence, they had lost the true meaning and purpose of the Communion. Before we go any further, here’s an important principle: Nothing is more life changing and behavior altering than the cross. There’s something about the cross that has the power to bring us to our knees. It has the ability and potential to bring things into perspective. If I may add, if the cross doesn’t do it for you, either your heart is too hard or you’re lost. Application: What goes through your mind when you take part in the Lord’s Supper? Do you picture yourself in the upper room, sitting across from Jesus? Can you see the stress on his face, knowing that in just a few hours he would be brutally nailed to the cross for the sins of the whole world? What’s next? 24 and when He had given thanks, He broke it and said, “Take, eat; this is My body which is broken for you.” Jesus gave a whole new radical meaning to the Passover Meal where He became the bread. Then he said – “do this in remembrance of Me.” What does that mean? It has several levels of meanings: remember in gratitude; identify with the crucified Christ; return to where it all began for you; and look forward to what God has in store for you. There’s one more – remember how guilty you are in the sight of God and how much you need his forgiveness and grace in your life. The Corinthians were so focused on status and pride, this was the farthest thing on their minds. Application: What will help a husband and a wife to forgive and love is Christ on the cross. What will help loved ones get along is Christ on the cross. What will help a divided church find healing is Christ on the cross. Have you turned to him yet? 25 In the same manner He also took the cup after supper, saying, “This cup is the new covenant in My blood. Application: Do you believe that you are part of this New Covenant in Christ? Do you actions match the actions of Christ? 26 For as often as you eat this bread and drink this cup, you proclaim the Lord’s death till He comes. 27 Therefore whoever eats this bread or drinks this cup of the Lord in an unworthy manner will be guilty of the body and blood of the Lord. Meaning: Don’t use my name if you don’t live by my example. What needs to happen? 28 But let a man examine himself, and so let him eat of the bread and drink of the cup. For the Corinthians it meant, remember that you are standing on hallowed ground. Don’t forget that someone died for your freedom. Meaning: Do a heart check and see if you are truly in Christ. Have you truly died with Christ, buried with him, and risen to walk in the newness of life in him? What if you don’t? 29 For he who eats and drinks in an unworthy manner eats and drinks judgment to himself, not discerning the Lord’s body. 30 For this reason many are weak and sick among you, and many sleep. 31 For if we would judge ourselves, we would not be judged. 32 But when we are judged, we are chastened by the Lord, that we may not be condemned with the world. People ask me – “Does God take the lives of people if they take the communion with sin in their hearts?” I remind them of Ananias and Sapphira in the Bible. God struck them dead after they lied about how much they had given. If that were happening today, we would need funeral directors at every service in every church across the world! They were set as an example for us to know that God takes lying and stealing very seriously. So also with how we treat each other in the Body of Christ. God takes it seriously. Are you saved? Have you done a heart check? Are you somber and treating others in light of the cross? This morning we will be observing Communion. Turn to I Corinthians 11 for our message titled, UNITY IN THE BODY. 1 Corinthians 11 23 For I received from the Lord that which I also delivered to you: that the Lord Jesus on the same night in which He was betrayed took bread; 24 and when He had given thanks, He broke it and said, “Take, eat; this is My body which is broken for you; do this in remembrance of Me.” 25 In the same manner He also took the cup after supper, saying, “This cup is the new covenant in My blood. This do, as often as you drink it, in remembrance of Me.” 26 For as often as you eat this bread and drink this cup, you proclaim the Lord’s death till He comes. Overall Background: About 10 months ago, Nicole and I stood in the very place where these words were spoken. It’s known as the Cenacle, the upper room, where Jesus celebrated the last supper with His disciples. How do we know that? Because, during the early centuries of Christianity, the church on this site was the center of Christianity in Jerusalem. Tradition claims that it was also the site where Jesus appeared to His disciples after the resurrection and where the Holy Spirit came upon them on the Day of Pentecost. Even though the rib vaulted bay (ceiling), columns, pillars, and walls have been rebuilt many times, parts of the floor are claimed to be original. I cannot describe the feeling I had when we stood on the very ground that Jesus and the disciples possibly stood or sat on for the Last Supper. Picture with me that night when Jesus was with His disciples in this upper room. Earlier in the evening Luke tells us in Luke 22:24 “there was also a dispute among them, as to which of them should be considered the greatest.” Jesus knew that and so in John 13 after the regular meal had ended Jesus began to wash the feet of His disciples. Why? To teach them what it meant to be humble. It was a demonstration of how they should be towards each other. They got it because when He revealed to them that one of them would betray Him, instead of being defensive or pointing fingers, Matthew 26:22 says, “they were exceedingly sorrowful…” and Mark 14:19 says, “they began…to say to Him one by one, “Is it I?”…“Is it I?” Meaning: They were not judging each other but themselves. Now, Jesus explained to them about the bread and the cup. What’s the point? Before the disciples could understand the meaning of the bread and the cup, there had to be a change in attitude from pride and self-righteousness to humility, sorrow, and self-examination. A change in attitude had to come before a change in understanding. Unfortunately, by the time Paul wrote this letter to the Corinthian church, they were anything but that. They were pushing and shoving each other at the Lord’s Table. They were divided. Question: How is your attitude this morning? Is there pride in your heart? Is there sorrow in your heart? Have you taken the time to think about what Jesus went through for you 2000 years ago? Have you examined yourself and asked – “Is it I?” or are you too busy judging others? Are you saved? 3 things we will see in this passage that will prepare us for Communion today and also bring unity in the body. To understand the context in which Paul wrote the words, we should begin in verse 17 Now in giving these instructions I do not praise you, (Paul is telling them the reason for these instructions. It is to correct them.) since you come together not for the better but for the worse. 18 For first of all, when you come together as a church, I hear that there are divisions among you, and in part I believe it. 19 For there must also be factions among you, that those who are approved may be recognized among you. Background: What is Paul talking about? The Corinthian church was divided. Why? They had a lot of problems. You have to read the previous 10 chapters to understand that. They were filled with envy, strife, sexual immorality, idolatry, stealing, cursing, and the list goes on and one. They were living in the flesh. You cannot be united as a body of Christ and have this behavior on the side. 20 Therefore when you come together in one place, it is not to eat the Lord’s Supper. In other words, it was no longer about the Lord’s Supper but their own supper. In other words, how the Corinthian Christians were acting at home is now how they were acting at church. Their personal sins were infecting the church body. What they were doing behind closed doors was now being done inside the church. 21 For in eating, each one takes his own supper ahead of others; and one is hungry and another is drunk. 22 What! Do you not have houses to eat and drink in? Or do you despise the church of God and shame those who have nothing? What shall I say to you? Shall I praise you in this? I do not praise you. Instead of the Communion being a time of humility, sorrow, and self-examination, they were having food fights! Who brought more food? Who brought less food? Who got in line first? As a result, some people were walking away hungry and some were walking away drunk. It was embarrassing! By the way, not much has changed, most church fights happen over food! Application: How is Sunday worship for you? If Sunday worship is a sign of Monday living, how is Monday living? Is there trash in your life that you haven’t dealt with? Are you bringing your trash into the church body? That phrase – “in remembrance of Me” is very important. What Paul is saying here is that the reason you all are acting this way is because you have forgotten that night when Christ washed the feet of His disciples and when their hearts were humbled, He explained to them about the bread and the cup. You have lost sight of Christ and not just any Christ but the Christ who gave His body to be broken for us. Once again, there is that phrase – “in remembrance of Me.” You have forgotten your Master and God Jesus who allowed His blood to flow out for you. What is the point? The antidote to disunity is a return to the night when Jesus revealed to His humble disciples the suffering that He was going to face. The reason churches are filled with pride and self-righteousness is because they have forgotten that night when Jesus was the focus and His sacrifice was the subject. Humility, great sorrow and self-examination was the only response. If there’s pride and hate in your life, bring the cross back into your memory. 1 Corinthians 11 27 Therefore whoever eats this bread or drinks this cup of the Lord in an unworthy manner will be guilty of the body and blood of the Lord. 28 But let a man examine himself, and so let him eat of the bread and drink of the cup. 29 For he who eats and drinks in an unworthy manner eats and drinks judgment to himself, not discerning the Lord’s body. 30 For this reason many are weak and sick among you, and many sleep. The consequence of their personal sins was weakness, sickness, and even death. Could it be that the church in America is weak, sick, and dead is because we have lost sight of the sacrifice and death of Jesus for us. Now, this is the crux of the matter – What do we do now? Listen to verse 31 For if we would judge ourselves, we would not be judged. The place to begin is to deal with sin in my own heart. What is the promise? If I do it, God won’t have to. Application: Have you examined your life lately? This does not mean that you need to do introspection on yourself—go looking for sin. Let God expose your sin. Let God decide what is sin in your life. Then deal with it harshly. What’s the result? It will bring unity in the body. Overall Background: The passage we just read is one of the most somber, sorrowful, and grim chapters in the entire Bible. The time had come for Jesus to go to the cross. This was not unexpected; this was not spur of the moment; this was prophesied; this was written centuries beforehand; this was the very reason that the second person of the Godhead came into this world as the Son of Man. His disciples knew that something was up but they were infantile in their faith and understanding. Make no mistake that they were saved – except one – but their eyes were not yet fully open. Jesus had tried to explain what was about to come several times but they still didn’t get it. About this time, there were two major holidays of the people of Israel – the feast of the Passover and the feast of the Unleavened Bread. Every nation has its holidays. In America we have the 4th of July, Memorial Day, Veteran’s Day and so on. These are man-made holidays and we enjoy them but there is only nation for whom God established their holidays – Nation of Israel. He gave them 7 holidays to be a prophetic reminder of the coming of Jesus Christ. In fact, the meaning of the Hebrew word translated “feasts” is “to keep an appointment.” God made these appointments with His people to meet with them at certain times. Jesus took this opportunity to reveal to His disciples that He was the fulfillment of the feast of the Unleavened Bread and the Feast of the Passover. Not only that, He also used this opportunity to reveal to them who was a true disciple and who was a false disciple. Application: This morning as we hear this message, let us not only see who Christ is but also who you are – are you a true disciple or are you a false disciple? Are you truly following Christ or are you playing Christianity? And if you are a false disciple, let the Holy Spirit turn you around to the truth. We will divide up this account into 3 parts: what took place before, during, and after the meal. I. WHAT HAPPENED BEFORE THE MEAL? Background: We have to start reading at Matt. 26:6-9 6 And when Jesus was in Bethany at the house of Simon the leper, 7 a woman came to Him having an alabaster flask of very costly fragrant oil, and she poured it on His head as He sat at the table. (Now who was this woman? When you place all 4 gospels side by side, like Paul Harvey, they tell us the rest of the story. This woman is none other than Mary the sister of Lazarus—whom Jesus raised from the dead. She had a terrible past until she met Jesus. She was so grateful that she sat at the feet of Jesus while Martha her sister complained about her. She loved Jesus. Somehow she understood that his death was significant. What happened when she anointed Jesus’ head and feet with the costly oil? 8 But when His disciples saw it, they were indignant, saying, “Why this waste? 9 For this fragrant oil might have been sold for much and given to the poor.” (Now Matthew does not identify the disciple. Once again, you have to turn to John’s gospel to get the rest of the story.) John 12:4-6 4 But one of His disciples, Judas Iscariot, Simon’s son, who would betray Him, said, 5 “Why was this fragrant oil not sold for three hundred denarii and given to the poor?” 6 This he said, not that he cared for the poor, but because he was a thief, and had the money box; and he used to take what was put in it. How did Judas react? 14 Then one of the twelve, called Judas Iscariot, went to the chief priests 15 and said, “What are you willing to give me if I deliver Him to you?” And they counted out to him thirty pieces of silver. 16 So from that time he sought opportunity to betray Him. How tragic! So close to the truth and yet so far away! II. WHAT HAPPENED DURING THE MEAL? Matt. 26:20 When evening had come, He sat down with the twelve.Application: Has the Holy Spirit of God opened your eyes? Are you a Mary sitting at the feet of Jesus, willing to break a costly perfume at the Master’s feet, grateful for what He has done for you? Or, are you a Judas cynical, critical, negative, stealing from God, blinded by the lures of the world? Background: What Jesus was about to celebrate with His disciples was something the Jewish people had done for 2000 years at the time. It was in accordance with God’s commandment to the people of Israel. God had commanded them through Moses that when they came into the land of promise, they were to observe this feast of the Passover and Unleavened Bread – the Seder. And if their children were to ask, “why?” They had to explain it to them. By the way, to this day, when the Jewish people celebrate Passover, the youngest child repeats the ritual question in the – Ma Nishtana? “Why is this night different from all the other nights?” Then the family reads from the Haggadah. You can imagine the disciples sitting down to go over these rituals and customs. Everything is ready – the approved lamb had been taken to the temple and slain. Then, it had been brought back and roasted and placed on the table. Also on the table was unleavened bread, bitter herbs, and now wine has been added to the meal. The disciples have no idea what is about to come. How tragic? Having dipped his hand with Christ in the dish, he continued on the course to betray him. His mind was made up. Application: Are you coming to church, taking part in the activities, serving in ministry, and even partaking of the Communion, and yet your life is unchanged. Once again you have to turn to John 13 to get the rest of the story – 27 Now after the piece of bread, Satan entered him. Then Jesus said to him, “What you do, do quickly.” And Judas left. When a person repeatedly rejects the invitation of grace to receive Jesus as Savior, he/she is opening himself/herself to Satan. Application: Have you repeatedly rejected God’s call of salvation in your life? Are you leaving the door open way for the enemy to come in? A Jewish custom originated about 3 centuries ago that puts three breads side by side. Then they reach down and pick up the middle bread and broke it. Isn’t it amazing that the middle Matzah is picked up out of the three pieces and that’s the one that is broken. Remember: the Father did not die on the cross, neither the Holy Spirit; only the Son. What is even more amazing is that they take one broken piece of the Matzah and wrap it and hide it for the children to find it – just like the Easter Eggs. Then, they bring out that hidden piece of bread – the Afikoman – that which is coming – at the end of the meal and eat it. It is a substitute for the lamb. For the past 1900 years the Jewish people have been celebrating the Pesach with no Lamb – where will you sacrifice it. No temple, no altar. The Afikoman represents Jesus who died and was wrapped according to the custom and buried Him in a grave but on the third day He came alive. Now the most powerful statement: Matt. 26:27 Then He took the cup, and gave thanks, and gave it to them, saying, “Drink from it, all of you. 28 For this is My blood of the new covenant, which is shed for many for the remission of sins. Judas did not get this – He was a false disciple. III. WHAT HAPPENED AFTER THE MEAL? Meaning: True disciples may fail, falter, and stumble but they are not lost eternally from the Father’s hand. 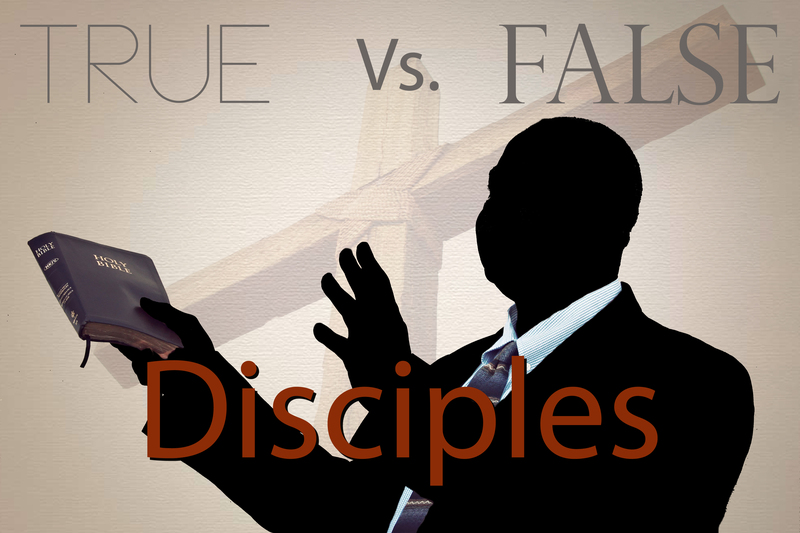 Application: Are you a true disciple or false one? Then they sang a hymn and 30 “…they went out to the Mount of Olives.” It is a custom to end the Seder by singing the Hallel (Psalms 113 through 118). Matthew 28:18-20 18 And Jesus came and spoke to them, saying, “All authority has been given to Me in heaven and on earth. 19 Go therefore and make disciples of all the nations, baptizing them in the name of the Father and of the Son and of the Holy Spirit, 20 teaching them to observe all things that I have commanded you; and lo, I am with you always, even to the end of the age.” Amen. Luke 22:17-20 17 Then He took the cup, and gave thanks, and said, “Take this and divide it among yourselves…19 And He took bread, gave thanks and broke it, and gave it to them, saying, “This is My body which is given for you; do this in remembrance of Me.” 20 Likewise He also took the cup after supper, saying, “This cup is the new covenant in My blood, which is shed for you. Overall Background: The two aspects of church that have lost their significance are Baptism and Communion. These two acts were meant to help us identify with Christ. 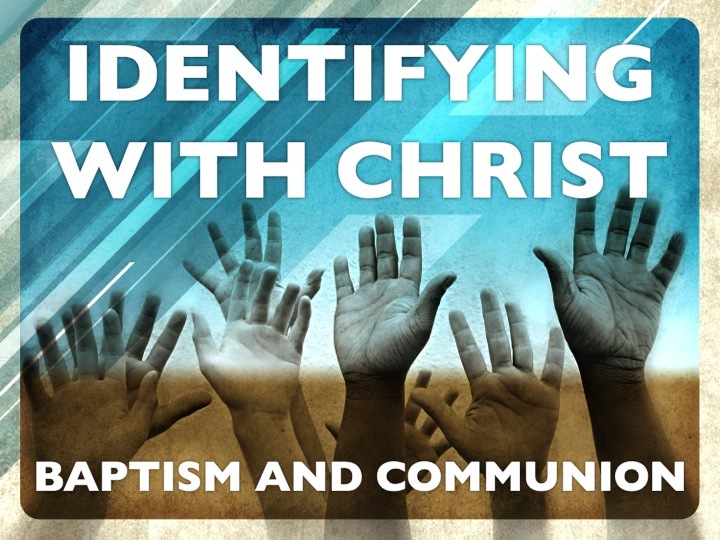 Baptism was to help us individually identify with Christ. Communion was to help us collectively identify with Christ. This morning we will briefly look at both of them so you can appreciate them in a whole new way. Background: Throughout the centuries Christians have disagreed over the meaning and mode of baptism. Some groups baptize primarily to wash away original sin. They think that there is something that miraculous in the water that has sacramental powers to make someone a Christian. Other groups baptize infants primarily as an initiation into the church. There are even some Protestant groups that do not claim that baptism washes away original sin but they claim that baptism includes children into the covenant God made with His people, kind of like circumcision in the Old Testament. Who is right and who is wrong? This morning we will not call names but simply see what the Bible has to say about baptism. Jesus Himself came from Galilee to be baptized. What was John’s response? Matthew 3:14 “John tried to prevent Him, saying, “I need to be baptized by You, and are You coming to me?” 15 But Jesus answered and said to him, “Permit it to be so now, for thus it is fitting for us to fulfill all righteousness.” Meaning: He identified with the people of Israel. He was obedient to the Father. He approved of John’s work. Later he even approved His disciples baptizing the people. If Jesus was baptized (being perfect), you should be baptized. 2. Jesus commanded new believers to be baptized. After Jesus rose from the dead, He appeared to His disciples many times. At His final appearance, in the presence of 500+ people, He gave them the charge to go into the entire world and preach the good news about Him. Listen to what he said in Matthew 28:18-20 18 “All authority has been given to Me in heaven and on earth. 19 Go therefore and make disciples of all the nations, Meaning: Not only get them saved from their sins but make them disciples. How do you make them disciples? The very next line says, “baptizing them in the name of the Father and of the Son and of the Holy Spirit.” Isn’t that strange that Jesus did not tell them make disciples – going to church, praying everyday, giving their tithes but baptism. Why Baptism? Because it is the first act of discipleship that a responsible person takes after they are saved. Why does discipleship begin with baptism? Because baptism tells the world that I am united with Jesus in His death, burial, and resurrection. I don’t have to do anything but simply reckon that it was applied to me the moment I was saved. All I have to do is now remember that I am one with Him. It is a sign that I am now cut off to the old world and have entered into the new. For e.g. Just like Marriage—as the Bible says is 7 ‘For this reason a man shall leave his father and mother and be joined to his wife, 8 and the two shall become one flesh’; (Mark 10) What if I had told Nicole right after the wedding – “Okay – now you can go home and I will call you when I need you.” It is a marriage already headed for disaster. Baptism is a reminder that now we are one with Christ. The early church diligently baptized new believers. Samaritans in Acts 8; the Ethiopian ruler; the Apostle Paul; the family of Cornelius; and so on. By the way since the earliest church history, the church always baptized by immersion – Ephesus, Emmaus, Milan, Tunisia and on and on. God wants your first step in the Christian life to be one of identification with Christ. He is not interested in making you a nice church member. He is not interested in making you a faithful church member. He wants your entire identity to be centered upon Jesus Christ. Jesus did not come to show you the Way. He is the Way. He did not come to teach you the Truth. He is the Truth. He did not come to give you Life. He is the Life. Application: Have you been baptized? That is your first step as a disciple. It sets the tone for the rest of your Christian life. Background: Just like Baptism, throughout the centuries Christians have disagreed over the meaning and purpose of the Communion. Some groups think that the communion has sacramental powers where the bread and wine literally transform into the body and blood of Jesus Christ. Even someone like Martin Luther, who led the Reformation, could not break away from the idea that there’s something special in the Communion. He claimed that Christ’s body is literally “in, with, and under” the bread and wine—whatever that means. Some groups think that the communion is God’s gift to the church by which he bestows grace and blessing. There are still others who don’t think that the bread and wine become the body and blood but they are still torn over whether there is a spiritual something in the Communion or is it only a reminder? Who is right and who is wrong? Just like baptism, lets see what the Bible has to say about communion. 1. Jesus commanded His disciples to keep the Communion. On the night before He was crucified, Jesus celebrated the Passover with His disciples. You can just picture it. They would have bought an approved lamb; taken it to the temple to be slain; then brought it back and roasted it; then set the table with the lamb, unleavened bread, bitter herbs, and now wine has been added to the meal. You can imagine the disciples sitting down to go over these rituals and customs but they had no idea what was about to come. Luke 22: 17-20 17Then He took the cup, and gave thanks, and said, “Take this and divide it among yourselves; Notice carefully: There is a collective approach to this act. He did not individually give it to each. There is a group dynamic in play here. Now comes the strange part—19And He took bread, gave thanks and broke it, and gave it to them, saying, “This is My body which is given for you; do this in remembrance of Me.” You can just imagine the shock in the face of the disciples 20Likewise He also took the cup after supper, saying, “This cup is the new covenant in My blood, which is shed for you. No Jewish person would have ever dreamed of saying that. 2. What did Jesus mean by that? The disciples did not understand it that night but they did later and Paul explained it to the Corinthians in I Corinthians 10:16-18 16 The cup of blessing which we bless, is it not the communion of the blood of Christ? The bread which we break, is it not the communion of the body of Christ? Meaning: When you take part of the bread and the cup, you are connecting with the sacrifice and the death of Jesus Christ. You are reminding yourself that your life is depending upon the life of Christ. He is your life. He is your sustenance. He is your spiritual nourishment. 3. What makes this different from baptism? While baptism is our individual identifying with Christ, communion is our collective identifying with Christ. Paul explains again in I Corinthians 10:17 For we, though many, are one bread and one body; for we all partake of that one bread. There is a communal aspect to this act. It is a family meal, where the main spiritual course is Jesus. Sadly, the Corinthians had forgotten this and were pushing and shoving at the feast. There was envy and strife and bitterness in the hearts of the people; there was sexual immorality in the church; there were marital problems; and the list goes on and on with idolatry and stealing and cursing and every evil imaginable. What they were doing in private life was simply bleeding over in their public life. Paul reminded them of the meaning of the feast and gave them a stern warning in I Corinthians 11: 29-30, 29For he who eats and drinks in an unworthy manner eats and drinks judgment to himself, not discerning the Lord’s body. 30For this reason many are weak and sick among you, and many sleep. Now some people have taken this to mean that there was something sacred in the Communion that killed off the people. Not true. It was no different than what happened to Ananias and Sapphira. When they lied to the Holy Spirit, they dropped dead. In the early church God allowed such radical responses to sin to send us the message that it matters when we sin in the body, the church. The Communion is important not because there is something miraculous in it but because it reminds us that we are connected to Jesus along with other brothers and sisters in Christ. Jesus takes it very serious when we try to attack the unity of His body. What is the solution? Listen to I Cor. 11: 33-34 33 Therefore, my brethren, when you come together to eat, wait for one another. 34 But if anyone is hungry, let him eat at home, lest you come together for judgment. Communion binds us together in Christ. Is there anything in your heart that is evil against another brother or sister? Confess it to the Lord and make it right. Matthew 26:30 “And when they had sung a hymn, they went out to the Mount of Olives.” Again, it is a custom to end the Seder by singing the Hallel (Psalms 113 through 118).